Lexbe eDiscovery Platform enables you to add documents to your case through our self-service upload facility, or we can upload for you. Please note that this page will keep a log of all the batches uploads so Admin Users in the account can track the productivity of the all the other users and delete selected batches. Title: unique name for each batch file uploaded to the case. 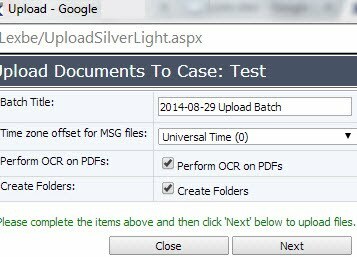 Report Hyperlinks: When you finish uploading batches of files, this feature will allow you to go from the Upload to Case Assessment page, and generate reports based on different options such as 'Doc Count By Master Date', 'Doc Count By Extension', 'Doc Count Unsupported by Extension', and 'Doc Count Failed To Convert by Extension'. For example, if you click on the option 'Doc Count By Master Date', the hyperlink will take you the take you to the Case Assessment page and display a report showing the file count based on the 'Master Date', which is the field that captures the main date and time an email family was sent (email and its attachments) or for non-emails the last date modified or the date created (if date last modified is not available). Please see our Case Assessment page for more details on advanced visual reports to help you more accurately track the files during the review process and successfully manage eDiscovery. Comments: it allows a text description of information about the batch. This could include where collected, collection procedures, etc. User Name: It shows which user uploaded the batch of files. Case Participant: By default, new batches have their 'Case Participants' set to 'Unassigned.' It allows you to associate a Case Participant with an upload batch. This can be a document custodian, party or even an unspecified shared collection (e.g., Shared Drive at Office'). Please note that Case Participants need to be set up prior to the commencement of the upload. Doc Source: it is used to identify sources of documents to allow filtering by source for later searches and other functions. When set before adding files, the added files will all be automatically assigned to the directed DocSource. Date: It tells the date on which the batches have been uploaded. Edit: This hyperlink allows you to edit the columns above-mentioned. Open the Case>Add Case Documents and click on the 'Upload' button. Please note that the number of individual or Batches of files you can upload at a time is also limited by your Internet connection upload speed. Upload speeds can vary greatly between users. Office connections (T-1, T-3, fiber) can be very fast. Cable and DSL connections are usually much slower. Cable and DSL connections are also usually non-duplexed, meaning that your Internet upload speed may be much slower than your download speed (6X or more). An office LAN with a T-1 line might be able to upload .5 GB per hour or more. Home cable connections often upload at the rate of 100 MB (.1 GB) per hour or less. We recommend that you experiment with you speed to determine the optimal upload size for you. To test your speed Internet, please click here. What happens after you click in the 'Upload' button? Once you click on the 'Upload' button, you will be taken to a new window 'Upload Dialog Box'. Please visit the 'Upload Dialog Box' help page for further details on how to proceed with the upload. Once the Settings have been set, click on the 'Add Files' button at the bottom and select the files to add from your local system. Depending on your computer platform, you also have the option of dragging the batches from your computer directly into "Upload Documents" page. From the upload dialog box you can click the ‘Cancel’ button to interrupt the file upload in progress. Progress is shown for each individual batch and for the entire upload. Do not close the upload dialog box before the upload completes or the upload will be disrupted. You can still upload individual files, PSTs or MSGs directly to your case(s) in Lexbe eDiscovery Platform without zip compressing from Windows and MAC platforms. Please do not open or keep opened any of your individual documents before you upload them to Lexbe eDiscovery Platform. 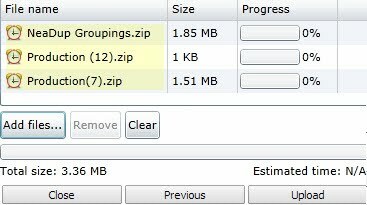 If you are uploading large files--or many files that add up to a large total size, please compress the files into a Zip file from your local desktop in order to optimize Lexbe eDiscovery Platform system's performance. Please note that the processing time varies due to file size. to receive automatic email notifications when a processing/upload is completed successfully, while you can do some other work. Please consider separating the batches if you have separate Custodians to be IDed, separate timezone PST's. The second step is to create individual or multiple files into one or more ZIP file format that we call 'Batch Files', limiting each compressed file to no more than ten GB in size archives prior to uploading. We cannot accept unzipped files because it might cause data corruption or errors during the file processing, and they also take much longer to upload and download resulting in lost time on the job. >For Windows users: we recommend that WinRAR be installed and used for creating the zip files as part of the Lexbe upload, production upload and load-file process. Other versions of Zip creation programs may work, but we have not tested them and do not support them. Versions are available for Windows and in application GUI utilities and as command line utilities. Free versions are available and registered versions cost about $35/user. Lexbe eDiscovery Platform supports over 100 file types. These can include Adobe's PDF file format, native file types such as Word, Excel, PowerPoint and other Microsoft office file types. You can also add PST or MSG files and many other popular file types and they will be converted to usable PDF for viewing, Bates-stamping, downloading, printing and producing. We also retain the extracted native file -- including attachments. Videos & audios file types will not be displayed directly in Lexbe eDiscovery Platform, but you can open locally using various video-playing software (e.g. Real Player). 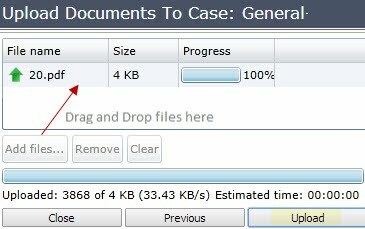 You should expect an approximately 10 GB/day processing rate within your Lexbe eDiscovery Platform account (combined all cases) for native files (including PDFs), or OCR of image PDFs, if you are uploading the files yourself. Similarly, you should expect an approximately 2.5 GB/day rate within your Lexbe eDiscovery Platform account (combined all cases) to create Productions (including Bates numbering and TIFF creation if selected) or Briefcase downloads. Your time to download is in addition to this, and will depend on your internet download speed. You should plan sufficient time to meet any production deadlines, including your quality control procedures, the possible need to rerun productions if changes are made, and possible delays in downloads/slower downloads than expected/need to restart downloads. We do not have a feedback indicator as this is a new feature. If this is insufficient, please let Lexbe Sales or Support know of your need and we can quote our eDiscovery services, which is designed to handle a much higher daily throughput rate. Also for upload of TIFFs or load files, please contact our sales department (sales@lexbe.com) or Support. We identify and attempt to convert (to TIFF or PDF), a wide variety of file formats such as as doc, eml, emlx, html, ics, ppt, rar, xlsx through our automated ESI processing. NOTE: Our system will not dedup email attachments. In case there is an email attachment and loose file that are the duplicate, both files will not be marked as duplicates in Lexbe eDiscovery. After clicking the 'Dedup Case Docs' button, you will see a message indicating the deduplication is running. You can work with pages while the deduplication is in progress, and the message will disappear once the files have been deduped. Deduplication time could vary greatly depending on the size and number of files. Once the deduplication is completed, go to the Browse or Search pages and apply the filter Duplicate>Show Duplicates Only. This feature will not change the file count within a case (no automatic deletion). NOTE: Our system will not neardup email attachments. In case there is an email attachment and loose file that are the near duplicates, both files will not be marked as near duplicates in Lexbe eDiscovery. Please note that Near Duplication can be used independently from Duplicate and vice-versa. Control numbers are assigned with MSGs email bodies being immediately followed by their attachments. Once control numbers are assigned to a case they are read-only and cannot be removed. If run again the control numbers will be added to any new documents in the case. Control numbers are available for sort and filter in Browse and filter in Search. Control Numbers can be printed on PDF downloads in a Briefcase. Control numbers can be helpful in identifying documents in the early stages of a case, which have not been Bates-stamped (in a production), or documents that a produced multiple times to different parties with different Bates numbers. Applying Control numbers does take time on larger cases and varies by case size. When running a 'Processing' message will be in the upper right of the screen. To see if complete, leave the page and return (simple page refresh may not show completion). You can delete the batch of document already populated. You can also delete PSTs, ZIP or RAR files uploaded to the case, once processing is done extracting and expanding all the files. However, you cannot delete the original files (native files) and only leave in the normalized PDF files. If an upload has been inadvertently interrupted before completion, you may be able to resume it by uploading the same files again. The upload process will automatically continue from where it was interrupted. >You can add video (and almost any) files to Lexbe eDiscovery. Our indexer (dtSearch based) will index extractable text, including metadata embedded sometimes within video files. >Video files can be downloaded with the briefcase and played locally when needed, even if cannot be played from the native tab. If you are having any trouble uploading documents, please refer to this troubleshooting page or contact customer support. PDFs are automatically made searchable with optical character recognition. The amount of time this can take will vary depending on the number and size of documents you upload and activities of other users as OCR is a shared service. If it is important that PDF documents be searchable immediately, you should OCR before upload. After the upload is completed, we advise you to check from the Search page to make sure all the documents recently uploaded were OCRed. For more details, click here for description. Austin, TX 78759 or contact us to set up this service. Please note that Lexbe does not support text searchability of separate TIFF/text file pairs (single-page or multi-page) and these files should be converted to multi-page PDFs using load file information before upload (not free of charge). For MSG files we also support automatic extraction of email metadata (date, time, sender, receiver, subject, type) and assignment to the corresponding fields in Lexbe eDiscovery, which aids in document review and preparation of privilege logs. To learn how to download and archive entire cases (zip format), please click here. Before you begin uploading PDF documents that contains images, we recommend re sizing the images to '8.5 x 11.00' to make the bates stamps clear visible at a page-level. During eDiscovery jobs or load file uploads of tiff files, the folder structure is not preserved. Folders are recommended for small cases only and coding fields (such as in load files) should be used for larger or complicated cases, and any with load files. The original file path may be preserved as metadata in the load file, and if so, will be associated with the Lexbe Original Source FilePath field if present. Lexbe eDiscovery maintains state-of-the-art security to ensure that customer documents are never compromised. Data security is our top priority and our redundant infrastructure, multi-level application controls, and strong in-place and 256-bit SSL transfer encryption deliver the highest levels of protection for your legal electronic stored information (ESI).